Image: Courtesy of Boston Public Library. Once a year or more, I fly from La Guardia airport in New York to Charlotte, North Carolina. The view that you get of the city just after take-off is stuck in my mind like the memory of a dream. A passenger (is it me?) looks out the starboard window. Below there’s the teeming grid of the Bronx. Reaching the approximate point in space at which a flock of Canada Geese collided with the so-called Miracle-on-the-Hudson airplane, US Airways Flight 1549, the passenger looks downward and notices a strange exception to the expanse: only a shape, a lopsided rectangle, at first glance; at second glance, an ordered warren of switch-backing brown brick buildings, a traffic circle for a navel, and grass between the massed buildings. It’s Parkchester, a massive apartment complex in the East Bronx. That was where his family once lived and, in their minds, many of them still do. Parkchester was built by MetLife on the grounds of the former Catholic Protectory, a home for what my grandmother would have called juvenile delinquents. (They had a good baseball team, according to my grandfather.) MetLife was then the second-largest corporation in the world after AT&T, so investing in the housing of the lower middle class—in what was then the largest housing development in the world—was in a sense a natural extension of the life insurance giant’s bio-political project. MetLife, unlike other major insurers, preferred to control the entire project rather than just hold the paper, and the company maintained that control for decades. 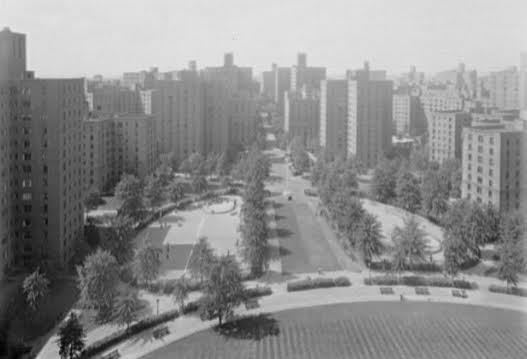 The lead architect at Parkchester was the Nova Scotian Richmond H. Shreve, who’d previously headed the team that designed the Williamsburg Houses, a public housing development on Graham Avenue in Brooklyn. The Williamsburg Houses are atypical for public housing in New York, with storefronts that look much like those in Parkchester. Shreve’s firm had already designed the Empire State Building, but the scale of the Bronx project was greater, even if it was less conspicuous. The scale of Parkchester is poignantly evident in a headline from a July 30, 1939 New York Times article published during its construction. “97,300 DOORS BOUGHT,” announced the article, and went on to discuss an order that was “placed with the Weisberg-Baer Company of Astoria, L. I., which is obtaining the Mississippi Delta sweet gum hardwood plywood required for 72,000 of the doors from the Mengel Company of Louisville, Ky.” Presumably the provenance of the wood for the remaining 25,300 doors has been lost to history. In any case, the place is massive. The Times also ran a photograph of the model that had been displayed at the 1939 World’s Fair in New York, a Fair whose futuristic slogan was “Dawn of a New Day.” The spectral scan of this photograph haunts me whenever I think about it. The Parkchester model was supposed to presage the way Americans were generally going to live in the future. But less than ten years later, Levittown, out on Long Island, provided an alternate model for middle-class American life, and the suburban model won in a rout, abetted by Robert Moses’s planning, Eisenhower’s Interstate Highway System, and the attendant Haussmannization of New York (and the United States generally). The success of Parkchester was fragile; it’s no wonder that it declined as the rest of the country moved on to other, more spread-out ways of living. Before World War II jolted the country out of the Depression, a place like Parkchester seemed ideal: nice, new, but thrifty and communal. Decades later, when I was a child, it seemed as old as the glacial rocks that dot its greens. With the Parkchester plan as a model, MetLife later built Stuyvesant Town and Peter Cooper Village in downtown Manhattan, the Riverton Houses in Harlem, Park La Brea in Los Angeles, and Parkmerced in San Francisco. The developments were the housing complements to massive office developments like Rockefeller Center, which MetLife invested in in the early 1930s but did not control directly. MetLife also held the mortgage on the Empire State Building, and, as far back as the 1920s, the insurer had an interest in building affordable housing in the outer boroughs. My great-grandfather’s first new job, after years of unemployment during the Great Depression, came as a construction manager at Parkchester, and once the development was completed in 1940, he moved into a new Parkchester apartment with his family. Before that, they’d moved every couple of months around the Bronx in an effort to avoid paying rent altogether. And before that, they’d had servants and lived in Upper Manhattan. In Parkchester, they were middle class for the first time. 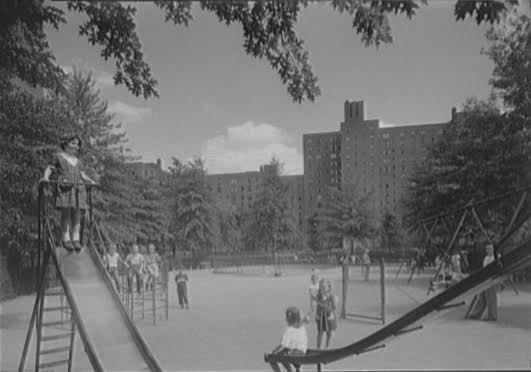 When the complex was completed, the New York Times wrote that it was “intended for families with incomes of $1,800 to $4,500,” which the Times described as the “middle-income group of the population.” (According to the Bureau of Labor Statistics, those incomes translate approximately to $30,500 to $76,000 in 2015.) 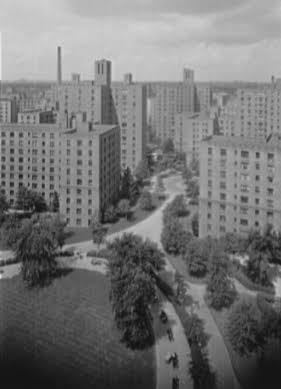 Though Parkchester was new and spacious, the apartments were rented for well below the prices of comparable housing: $12 per room per month, as opposed to the $18-28 in similarly appointed apartments. Up until the late 1960s, Parkchester was segregated as starkly as any place in the South. As explained in Lloyd Ultan’s Bronx history The Northern Borough: “Most of those who moved in were of Irish extraction, with Jews forming the seconds largest group.” There were many Italians, too; it was a prototypical mid-twentieth-century “white ethnic” New York mix. Only white renters made it through MetLife’s rigged interviews of prospective renters; during the period when MetLife owned Parkchester, applying tenants had to interview for an apartment, and they’d be accepted only “if their character and economic status [was] up to snuff,” in the euphemistic words of the Architectural Forum. Black renters were instead steered to the Riverton Houses. Segregation was MetLife’s disturbing way of “protecting” their investments in the Bronx and on the East Side, and it’s something that most former residents don’t talk about. Charles V. Bagli’s Other People’s Money chronicles, in part, the fight to desegregate Parkchester’s sister development, Stuyvesant Town, and while the struggle in Parkchester is more obscure (as Parkchester itself is), it is clear that MetLife chief Frederick H. Ecker’s personal racism was only part of the problem. The playwright and director John Patrick Shanley is from a nearby neighborhood, and attended the church and school at St. Helena’s, which is just south of Parkchester on Olmstead Avenue. In 2008, his Pulitzer Prize-winning play Doubt was made into a movie, which was also directed by Shanley, and they’re both set in an unnamed Catholic school on the edge of Parkchester in 1964, based on both St. Helena’s and St. Raymond’s (where my father went to school). In the movie there is a scene that was shot on location in Parkchester, in which Sister Aloysius (played by Meryl Streep), a member of the Sisters of Charity, walks through the inner courtyards of Parkchester with the mother (Viola Davis) of the school’s first black student. The student, Donald Miller (Joseph Foster), may or may not have been assaulted by a priest, Father Flynn (Philip Seymour Hoffman); his mother says that she doesn’t want the incident investigated. She just wants her boy to finish school. We’re told that she works in Parkchester; since it’s 1964, we also know that she doesn’t live there—she couldn’t have. Had she felt like an equal in her own neighborhood, her dismissal of Sister Aloysius’s concerns wouldn’t be as easy to comprehend. The Parkchester I knew, where I spent many days in my early childhood under my grandmother’s watch, was a diverse neighborhood. Nobody had much money. I crawled under the coffee table and looked up at the crayon-scrawled map of America my father had drawn three decades earlier. When I think of the older Parkchester, the one where my father grew up, I think of church raffles at St. Raymond’s in the Fifties and Sixties, the “Spaldeens” my dad bounced as a kid, my grandmother sitting through the hot nights in her apartment at the corner of Metropolitan Avenue and Purdy Street (watching the Mets in penance for all the nights she’d yelled at my grandfather to switch off the game), and the lighthearted terra cotta WPA-style statues on all the buildings. Though nearly all the mid-century residents (and their children) have left by now, my grandmother stayed until the year 2000, and her funeral mass was held at St. Raymond’s in 2006. Though Parkchester is no longer segregated, the country and the city are still segregated in new, less official ways. The margins of the neighborhood may seem strange to outsiders. In the 1960s, Jane Jacobs described the Parkchester retail scene on the edges of the project in The Death and Life of Great American Cities: “We can see such an outcast huddle, supported by Parkchester people. Beyond a corner of the project, hideously clumped on a stretch of pocked asphalt left over from a gas station, are a few of the other things the project people apparently need: quick loans, musical instruments, camera exchange, Chinese restaurants, odd-lot clothing.” It’s still like that, only more so. At the intersection of Castle Hill and Zerega Avenues, there’s a car wash called Stop ‘n’ Stare with a gorilla mascot on its sign. This strangeness has filtered into literature, too. A deeply confused character in Don DeLillo’s story “The Starveling,” from the Fall 2011 issue of Granta, gets off the 6 train at Castle Hill Avenue, sees the evocative business names “Tattoo Mayhem, Metropolitan Brace and Limb”—both real places just outside Parkchester—and feels “the heat, Bangladeshi heat, West Indian heat,” echoing, to my ear, the opening line of Saul Bellow’s second novel, The Victim (“On some nights New York is as hot as Bangkok”). The character, a Manhattanite originally from Philadelphia, can’t make sense of the environment. He sees the Bronx through prejudicial eyes. MetLife sold Parkchester to the real estate firm run by the tycoon Harry Helmsley—an East Bronx boy himself—soon after the Civil Rights Act of 1968 was passed and housing discrimination was made a punishable offense. Under Helmsley’s ownership, the place experienced a long period of neglect (and disinvestment following condominium sell-offs), but more money flowed in after it was sold to the Community Preservation Corporation in 1998. Since then, new wiring has been installed, making air conditioning possible for the first time, as well as new windows. At a seventieth-anniversary reunion that I attended with family members in 2010, we were shown bar charts of the increase in apartment value since the Nineties. There’s a spiffy website, part of a quixotic gentrification campaign. But the subway ride down to Midtown is still as long as ever, and Parkchester’s red-brick buildings have only a counterintuitive kind of beauty. On the morning of the reunion, I walked downtown to my parents’ hotel so that we could take the Lexington Avenue line uptown. A man on the subway asked, “You guys aren’t trying to find Yankee Stadium, are you?” There was a game on that afternoon. My father, the Bronx émigré, brushed him off: “No.” But he whispered to me, “That’s a nice guy.” He was right, and my father didn’t bristle the way he could have—being from the Bronx and having taken that exact route countless times. We got off the 6 at the Parkchester station and walked up Metropolitan Avenue (named after MetLife, of course), glancing at places still charged by moments passed. Standing on Metropolitan Avenue, looking down the tree-lined thoroughfare towards the Oval, one feels the confidence with which the place was built. It’s grand. By Purdy Street we ran into a man named Tommy, a man with savant syndrome who has lived in Parkchester his entire life. He remembers things, birthdates and facts about the people who have spent time in the neighborhood, even someone like me. He remembered my birthdate along with everyone else’s, and he knew how much it snowed that day. He recalled my grandmother and her habit of drinking a little beer with dinner. Ask him anything about the neighborhood: he knows. His mind is a register for a now-disparate group of people, spread out across the country, and, surely, for those who live around him now. Images: Courtesy of the Library of Congress.